Experience the true heart of Nashville aboard our new Soul of Music City – Nashville’s Night Tour! Led by a talented performing guide, you’ll be transported on an exciting journey to explore the different music genres that have been in Music City over the years. From the city’s honky tonks to its famous music venues, uncover insider stories and intriguing facts about the people, places and events responsible for the city’s iconic reputation. It’s an evening filled with music, history and fun and a close-up view of some of the most legendary spots in town. Unlike any other city in the world, music is deeply rooted in the heart and soul of Nashville. The city’s earliest settlers arrived with fiddles; poised to play the lively tunes that celebrated their newly discovered southern oasis. It wasn’t long before guitars, banjos and drums made their way into the hands of musicians and songwriters—and soon after Music City was born. This tour will take you through it all. You head past Printers Alley, Ryman Auditorium, the Barbershop Harmony Society, Music Row, Third Man Records, and more! 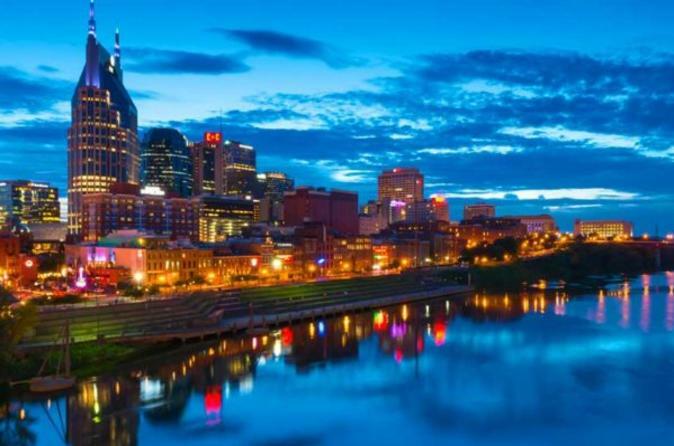 Learn about each of these fascinating places comfortably aboard your trolley and gain a new appreciation for Nashville, its musical heritage, and its city lights on this night time tour.